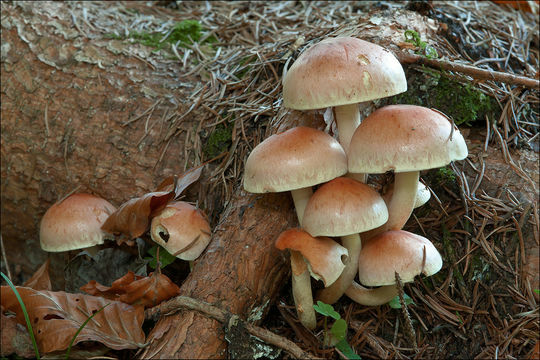 Hypholoma lateritium (Schff. : Fr.) Kummer, syn. Hypholoma sublateritium (Fr.) Quelet, Psilocybe lateritia (Schff. : Fr.) Noord.Brick Tuft, DE: Ziegelroter SchwefelkopfSlo. : rjavordea veplenjaa, openatordea veplenjaaDat. : Oct. 19. 2015Lat. : 46.33154 Long. : 13.68735Code: Bot_921/2015_DSC9456Picture file names: from Hypholoma-lateritium_raw_20 to Hypholoma-lateritium_raw_28.Habitat: overgrown former pasture, now thickets of low trees and bushes, Picea abies, Acer sp., Corylus avellana, Fagus sylvatica dominant; moderately inclined mountain slope, northeast aspect; calcareous ground, close to a small water stream; in shade, partly protected from direct rain by tree canopies, average precipitations ~ 3.000 mm/year, average temperature 6-8 deg C, elevation 640 m (2.100 feet), alpine phytogeographical region.Substratum: apparently on ground, actually on buried rotten wood or roots of an unknown kind. Pilei shown on picture 25 growing probably on Picea abies.Place: Lepena valley, southwest of the road leading to Na skali settlement, next to the trail to r place, East Julian Alps, Posoje, Slovenia EC Comments: This very common but also very beautiful mushrooms were growing in five groups from a few to many fruit bodies; pileus diameter up to 6 cm, stem up to 10 cm long and 7-8 mm in diameter; taste unpleasant, somewhat biter; smell indistinctive, mushroomy or on dust or soil, SP surprisingly abundant, purple-brown with a violet tint, oac525.Spores smooth. Dimensions: 6,2 [6,7 ; 6,9] 7,3 x 3,9 [4,2 ; 4,3] 4,5 microns; Q = 1,5 [1,6] 1,8; N = 30; C = 95%; Me = 6,8 x 4,2 microns; Qe = 1,6. Olympus CH20, NEA 100x/1.25, magnification 1.000 x, oil, in water. AmScope MA500 digital camera.Herbarium: Mycotheca and lichen herbarium (LJU-Li) of Slovenian Forestry Institute, Vena pot 2, Ljubljana, Index Herbariorum LJFRef. :(1) J. Breitenbach, F. Kraenzlin, Eds., Fungi of Switzerland, Vol.4. Verlag Mykologia (2000), p 328. (2) G.J. Krieglsteiner (Hrsg. ), Die Grosspilze Baden-Wrttembergs, Band 4., Ulmer (2003), p 358. (3) R.M. Daehncke, 1200 Pilze in Farbfotos, AT Verlag (2009), p 605. (4) A. Poler, ed., Seznam gliv Slovenije, 2nd Ed., Assoc. of Mycol. Soc. of Slovenia (in Slovenian) (1998), p 224. (5) R. Phillips, Mushrooms, Macmillan (2006), p 232.